A nine selection machine that vends 12 oz. cans, 16.9 oz. and 20 oz. bottles that you can rely on day in and day out. Single pricing – all items priced the same from $0.05 to $99.95. Dixie Narco 501 E single price machine Soda Machine Dixie Narco 501 single price Soda machine is one of the most reliable can or bottle vending machines in the market. Since the Dixie Narco 501 E single price soda machine is a nine selection machine that vends 12 oz. cans, 16.9 oz. and 20 oz. Bottles. This is one of the machines you can use throughout the day without any fear of breaking down.After years of being in this business we know what to replace on a machine and what to keep. 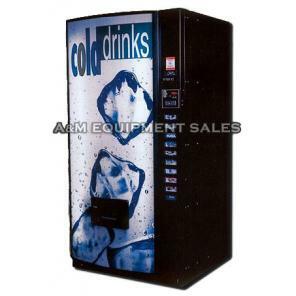 Remember we have been in Vending since 1964 and have remanufactured machines for some of the larger bottlers such as Pepsi, Gatorade, Nestles Waters, and Nestle Quick. Quality is what we look for every day. Very simpe machine. No boards old school no power problems when you have a lightning storm. Draw back is all product must be set at one price. Great for vending all cans or all bottles at one price. This machine comes with refurbished validator and changer. Can/Bottle drink machine is outdoor approved. Dixie Narco 501 E Can/Bottle machine will vend Monster Energy Drink, 12oz cans, 16oz and 20oz bottles. New lexan live display sign, paint, new lock and keys, your choice of flavor strips, prices and make our can drink machines look new. Every can drink machine goes through our rigorous refurbishing process. Comes with new Lexan waterfall drink sign. Remanufactured by A&M Equipment Sales see remanufacturing process.